Dominant Blackburn came from behind to take a point after Bradley Dack finally found a way past inspired Rotherham keeper Marek Rodak. 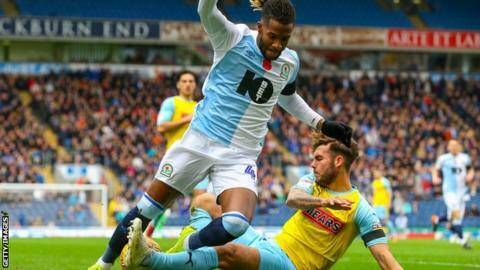 Rodak made a string of vital saves to deny Rovers, including two in two minutes as Danny Graham and Elliott Bennett both went close for Tony Mowbray's side. And Paul Warne's visitors almost grabbed their first away win of the Championship season when Michael Smith headed them in front with 15 minutes left. But in-form Dack, who has now been directly involved in 15 goals in his 15 appearances for Rovers this season, turned home Ben Brereton's cross at the near post with a smart finish to level. Rovers have now lost just once in nine league games on home turf this season, but remain eighth after a stalemate that saw so many chances go begging, while the Millers drop a place to 19th. Despite missing out on the win, Warne can reflect on an inspirational display from Slovakia Under-21 international Rodak, who excellently denied Dack before the Rovers man's eventual leveller and also thwarted Adam Armstrong late in the contest. Meanwhile, Mowbray can point to his changes, along with the fine form of Dack, for his side's point. He brought Brereton off the bench to create the breakthrough and the hosts finished the stronger of the two sides. "Frustration is probably the best word. First half we struggled a bit with their directness and long throw ins and didn't deal with the first ball very well. The second half was as good in possession creating chances as we've been and just a real frustration we only managed to create one goal. But it's done now. There was a lot of good play. "They went and scored from their only shot on target." "I think it's a point gained. We started well but it's a difficult place to come and their home record is pretty phenomenal. They've beaten Leeds and QPR here. "It was disappointing because I think their goal was offside but I'm not being a baby about it because their play probably deserved a goal." Match ends, Blackburn Rovers 1, Rotherham United 1. Second Half ends, Blackburn Rovers 1, Rotherham United 1. Attempt missed. Adam Armstrong (Blackburn Rovers) left footed shot from the centre of the box misses to the left following a corner. Corner, Blackburn Rovers. Conceded by Clark Robertson. Attempt blocked. Elliott Bennett (Blackburn Rovers) left footed shot from outside the box is blocked. Assisted by Kasey Palmer. Corner, Blackburn Rovers. Conceded by Michael Smith. Attempt missed. Richard Towell (Rotherham United) right footed shot from outside the box is too high. Attempt missed. Darragh Lenihan (Blackburn Rovers) header from the centre of the box is close, but misses to the left. Assisted by Joe Rothwell with a cross. Substitution, Rotherham United. Kyle Vassell replaces Ryan Williams. Corner, Blackburn Rovers. Conceded by Marek Rodák. Attempt blocked. Elliott Bennett (Blackburn Rovers) right footed shot from outside the box is blocked. Assisted by Joe Rothwell. Attempt blocked. Joe Rothwell (Blackburn Rovers) right footed shot from outside the box is blocked. Assisted by Amari'i Bell. Attempt missed. Kasey Palmer (Blackburn Rovers) right footed shot from the centre of the box is close, but misses to the right. Assisted by Bradley Dack. Attempt blocked. Ryan Williams (Rotherham United) left footed shot from outside the box is blocked. Attempt blocked. Bradley Dack (Blackburn Rovers) right footed shot from outside the box is blocked. Assisted by Elliott Bennett with a headed pass. Kasey Palmer (Blackburn Rovers) wins a free kick in the attacking half. Foul by Ben Wiles (Rotherham United). Goal! Blackburn Rovers 1, Rotherham United 1. Bradley Dack (Blackburn Rovers) right footed shot from the centre of the box to the bottom right corner. Assisted by Ben Brereton. Corner, Blackburn Rovers. Conceded by Richard Wood. Attempt missed. Ryan Nyambe (Blackburn Rovers) header from the centre of the box is close, but misses to the left. Attempt saved. Adam Armstrong (Blackburn Rovers) right footed shot from the left side of the box is saved in the top left corner. Assisted by Joe Rothwell. Michael Smith (Rotherham United) is shown the yellow card for a bad foul. Substitution, Blackburn Rovers. Joe Rothwell replaces Danny Graham. Kasey Palmer (Blackburn Rovers) wins a free kick in the defensive half. Goal! Blackburn Rovers 0, Rotherham United 1. Michael Smith (Rotherham United) header from very close range to the bottom right corner. Assisted by Ryan Williams with a cross. Attempt missed. Danny Graham (Blackburn Rovers) header from the left side of the six yard box misses to the right. Assisted by Elliott Bennett. Attempt blocked. Richard Towell (Rotherham United) right footed shot from outside the box is blocked. Assisted by Joe Mattock. Substitution, Rotherham United. Ben Wiles replaces Zak Vyner.